Thank you for visiting our registry! We are so thankful for all the friends and family who have come around us during this exciting season. 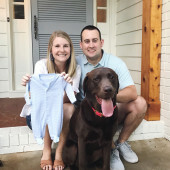 We can’t wait for baby James to know and be loved by all of you!